Qantas is shaking up its approach to how advertising is integrated into its in-flight entertainment, announcing an invitation-only tender to the free-to-air and pay TV networks, as well as incumbent Bauer Media, which has managed on-screen advertising on board for the airline since 2001. Currently, the advertising follows a fairly traditional model of TV adverts in between programs, but the airline is now looking to update this approach to include dynamic displays, banner ads, sponsored content and dedicated channels. An example of dynamic displays could be adverts tailored between First, Business and Economy cabins, which is possible using current hardware. Qantas carries around 50 million passengers a year and feedback shows that in-flight entertainment is one of the most important parts of their journey. Formats include back of seat screens, iPads with streaming of onboard content and main screens. Incumbent Bauer also manages the in-flight magazine, Qantas the Australian Way, which has a readership of around 670,000. The magazine is not part of the review. The outcome of the tender is expected to be announced during May 2014, with a new contract to come into effect by 1 July 2014. The proposal doesn’t extend to any major hardware changes, which are determined by an existing product cycle that is managed by the airline. Dig Music, the digital radio station Triple J took over last year is being relaunched as Double J, which is what Triple J was originally called from 1975 to 1980 before it switched over to FM. Former Triple J presenter and Spicks and Specks captain Myf Warhurst will launch the station with a new program from 11am to 3pm weekdays. SBS this morning announced its broadcast schedule for the 2014 FIFA World Cup in Brazil. All matches will be live on SBS ONE and SBS HD, with the only exceptions being the concurrent group stage matches which will be broadcast live on SBS 2 and then replayed on SBS ONE immediately afterward. All matches will also be streamed online. The 2014 FIFA World Cup will kick off with the opening match between Brazil and Croatia at 5:30am AEST Friday 13 June live on SBS ONE. The Socceroos FIFA World Cup campaign will begin the following morning when they take on Chile at 7:30am AEST Saturday 14 June live on SBS ONE. The FIFA World Cup Show, hosted by Les Murray and Craig Foster live from Rio de Janeiro, will air every night at 9:30pm on SBS 2 and will include match highlights and analysis as well as interviews, features and the latest news. The latest reporting of EMMA data claims the move to digital consumption of journalism is accelerating. The total audience readership for major national, metropolitan and regional newspaper media has also increased by 2.4% over the eight months from the first EMMA data release for June, 2013. Digital content is the key driver of this growth, with total digital audiences jumping by 13.5% over the same period, while the print audience declined 5.2%. Total readership of newspaper media remains at 16.2 million people a month, representing 93% of the population aged 14 and over. Print readership still accounts for a significant proportion of total consumption of newspaper media, at 14.7 million people, or 84% of the population aged 14 and over. An adventure travel series featuring Australian model, Myer Ambassador and MTV presenter Kate Peck, A Model Adventure will attempt to crack a male dominated adventure market risking life and limb in a number of heart-racing expeditions and long distance races. The series aims to inspire and entertain as viewers see Peck bare all – physically and emotionally. It’s the latest project of Sydney’s Candid Projects and will screen on Nat Geo People in June 2014. The Audited Media Association of Australia (AMAA) has commenced reporting auto-refresh activity alongside its suite of audited website measurement metrics. The association looks to deliver further reporting and transparency for online publishers and advertisers when selling and buying advertising. The auto-refresh number is separate of other audited website measurement metrics and sits alongside average daily unique browsers, page impressions, time on site and page duration figures. Roy Morgan Research has partnered with Mi9’s new specialised data services venture Tipstone to transform online account data into life-sized consumer profiles for marketers. The non-exclusive data partnership will see Roy Morgan’s profiling tool Helix Personas form the backbone of Tipstone’s data segmentation and analytical services for Australian businesses. Helix Personas has segmented and mapped Australian consumers into 56 personas across seven communities. Integrating Helix Personas with its rich online data set will enable Tipstone to connect the dots between digital account activity and the real-world behaviours, attitudes and lifestyles of Australian consumers. Once aggregated and anonymised, the segmented data will give a newfound ability to identify, recognise and communicate with website visitors and app users. Nova Entertainment has announced the launch of Nova TV, a service that will allow listeners to play on-demand music videos using Nova’s playlist as well as allowing users to watch on-air personalities in a “seamless” experience. Nova TV is the result of Nova Entertainment’s new partnership with Vadio, a global video technology firm specialising in utilising broadcast audio playlist data and converting it into engaging mobile and social content. Nova TV will be available from May and will be accessible via Nova’s on-line, mobile and social platforms. CBS Television Network last week announced that Stephen Colbert, the host, writer and executive producer of the Emmy and Peabody Award-winning The Colbert Report will succeed David Letterman as the host of The Late Show in a five-year deal. Colbert will take over when Letterman retires from the broadcast, which is expected sometime next year. 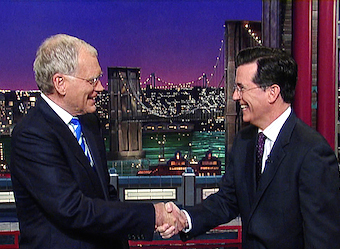 Letterman, the longest ever late-night host, announced his retirement on 3 April. He’s hosted the CBS late night series for 21 years, after famously moving from NBC in 1992, where he had hosted Late Night with David Letterman for 10 years. The decision to sign Colbert is believed to be partly to attract his existing younger audience, something CBS has struggled to do. Until now, Colbert has been primarily known as his alter ego, also called Stephen Colbert, a parody of conservative, tabloid news presenters which starred on Jon Stewart’s The Daily Show and then hosted his own spin off, The Colbert Report. When he moves from Comedy Central to CBS, however, he’ll be dropping the character, giving viewers a chance to see the real Colbert.